We were pretty psyched when we were contacted to create the brand development + website design for the next major e-commerce brand + website for backpacks; a lifestyle brand to stand behind the name Backpacks.com. We equated this brand development project to our favorite coffee brand. When someone wants coffee, it is known that a Starbucks run is on the horizon, without thought of going anywhere else. Not that cute cafe around the corner. Not even that old donut shop, I mean, Dunkin’ Donuts. Sorry double D.
When consumers think ‘backpack’ we wanted them to think Backpacks.com. The company got started on the right foot, seeing they owned the domain backpacks.com. With this strong foundation, helium had a solid platform to position the concept, create the story, define strategy, design the identity, set a tone for photography + videography, coordinate copy writing, then design the website. Backpacks.com was off to become the next big lifestyle brand with a tailored online experience and curated selection of backpacks to carry on your journey through life. 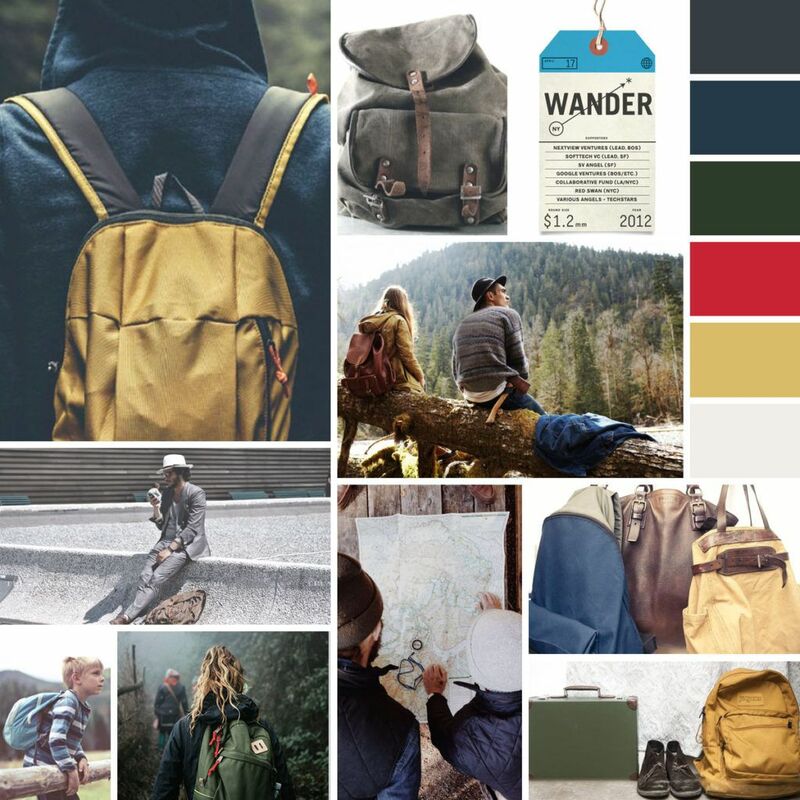 A tailored online experience and curated selection of backpacks to carry on your life journey. During our discovery meeting, a Backpacks.com team member told us his backpack was like a best friend. It traveled the world with him, carrying his most prized possessions. The necessities of life, the things he did not pack in a suitcase for fear of losing them. The Backpacks.com story and its audience began to shape like the congealing of jello in the refrigerator. Nice use of simile, huh? We realized the root of this brand is the relationship a person has with their backpack. Throughout life transitions the one constant, the one continuous resource along the way is a backpack. Always there for the adventure; to support and carry the load so you can enjoy the ride. More than a backpack, it’s a companion for life-travelers. Once the narrative was composed, the brand strategy fell into place. We positioned Backpacks.com as a brand for life-travelers seeking the perfect backpack to accompany their journey. Backpacks.com offers a curated selection of top brand products through an online tailored customer experience. Backpacks.com is a timeless brand set to stand strong as the top online backpack retail experience. A refined brand emphasizing the idea that a backpack accompanies you along the journey through life, from childhood to adulthood. Naturally the identity followed these footsteps. The logo was designed to pay homage to the patch found on so many backpacks throughout history. A functional design element one thinks of as inherent to the traditional backpack, this diamond shape became our icon. The goal was to own the backpacks space, so why not own the symbol associated with it. We paired the logo with: Along For The Journey. This tagline speaks to our initial story that the backpack is with your on your journey through life, it is the constant accessory that ‘has your back’. And the Backpacks.com brand is with you on that journey. We drew visual inspiration from all over. A mood board was created to dictate future brand photography, the overall brand mood and style, color palette, language and typography. With six lifestyle categories, we identified each with a corresponding name and color. The intention was to keep the color tonality sophisticated with the brand while speaking to the individual category. The Outdoor sector, for example, was assigned a deep green to resonate the feeling of nature. Taking a cinematic photographic approach to visually tell the story of the Backpacks.com lifestyle, we asked our photography + videography team, The Guild Five 45, to make the audience feel as if they are watching a film, peering into intimate life moments. The tone is timeless with a sense of wanderlust + nostalgia. Gray, desaturated cool undertones juxtapose vibrant warmth for visual and verbal imagery that is cinematic. The images below are from the photoshoot for the Backpacks.com brand + website. In the end, we crafted a unique, curated e-commerce brand experience designed to support a brand with aspirations of dominating the online backpack category, a brand competing with the likes of Amazon.com + Ebags.com. Strategy, identity, still imagery + video, and website design = a brand development + design project we are mighty proud of. For more design, inspiration + brand development follow @heliumcreative on Instagram, Facebook + Twitter.